Our day trip from Zurich starts between 7 and 8 am with a train ride from the Zurich central station to Engelberg from where we will begin our journey up to Mount Titlis. Two different gondolas, the Titlis xpress and the famous Titlis Rotair, the first revolving gondola, will bring us to the summit at 3020 meters above sea level. There you have plenty of time to enjoy the views and have a lunch. 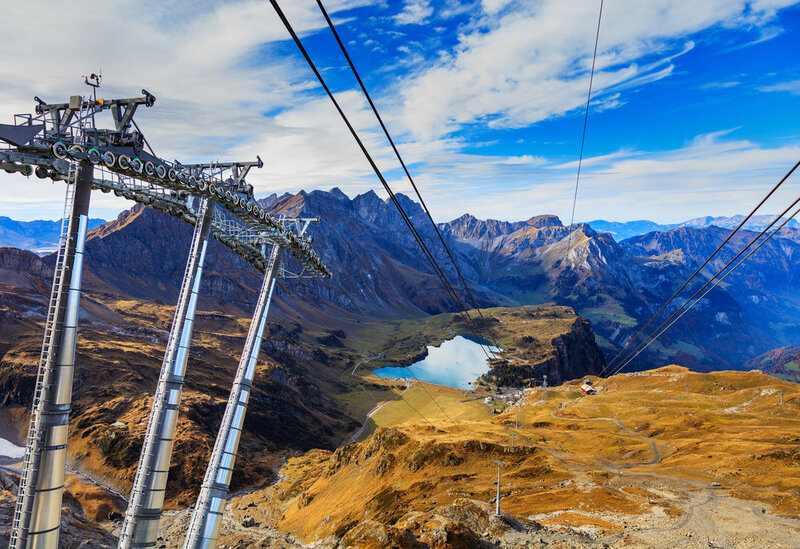 We can take the Titlis Iceflyer (weather permitting) over a beautiful glacier landscape and do a thrilling walk over the new Cliff Bridge, the highest suspension bridge. We can stay up to four hours on the Mountain peak. Enjoy this once-in-a-lifetime experience without rush. When you are ready for the desent, we return to Lucerne where we do a walking tour. Walk over the Chapel Bridge, the landmark of the city. It will take us to the old town. From there we continue to the Lion monument. After this fascinating day, we start the return trip to Zurich. We arrive between 7 pm and 8 pm at the Zurich main station. -Approx. 1 hour walk on the peak to see all attractions (can be shortened if desired). Surcharge of CHF 30.- per adult for bookings and prepayments less then 8 days before departure.